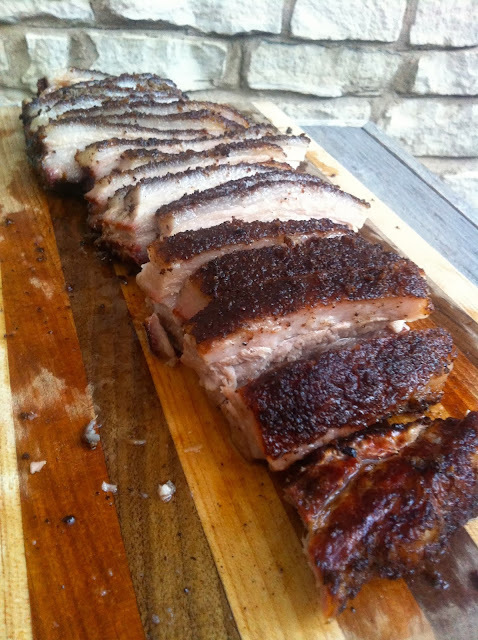 I think its time we make pork belly a "Christmas Food." I mean, forget ham. Forget the stupid turkey. All I want is pork belly in my belly. 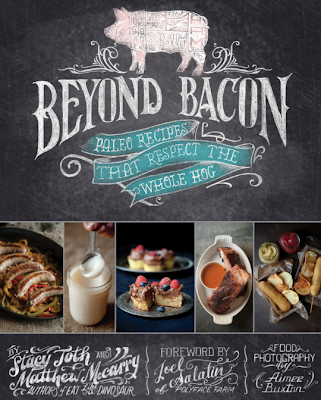 This beauty came out of one of the most incredible Paleo cookbooks to hit the shelves in 2013, Beyond Bacon by Stacy Toth and Matthew McCarry. Stacy and Matt are better known as The Paleo Parents, where they blog about raising their family on real food. They have written two books and are working on their third. My favorite recipe in their book is the smoked pork belly. We have made it four times already, and every time it turns out perfectly. This is a two day feast. After smoking this tender, juicy slab of heavenly meat, we enjoy it for a fantastic dinner. The next morning, we slice up the rest of it, pan-fry it, and eat it with eggs. Then we fight over the rest for lunch. My favorite way to eat it is pan fried. Sooo crispy. Its un-bacon. You know how I feel about bacon. This is so much better. Fudge, lard, stir-frys, sausages, pork chops and even tamales, this book covers it all. Limited only by their creativity, Stacy and Matt really did what they set out to do: They created paleo recipes that respect the whole hog, from nose to tail. So you want it? In this 4th installment of Thanksgiveaway, you can get it! Leave me a comment below with your favorite holiday dish and your email address. Example: Ellen's Squash Casserole. brittanie36(at)gmail(dot)com. I'll announce the winner on Sunday, December 29, 2013. Good luck! Favorite holiday dish: Homemade cinnamon rolls on Christmas morning. Favorite holiday dish is No Joke Chocolate Cake from Zenbelly blog. My favorite is cranberry apple pie which I'm working on making paleo. Favorite christmas food item is roast duck. Its so unbeliveably good. My favorite Christmas dish is scalloped potatoes. I have to have them once a year! My favorite holiday dish is minestrone soup. my very very very favorite holiday food is .... leftovers and the incredible concoctions I am able to make from whatever shows up in the fridge.... its good stuff! Today was a little paleo cheat but I used a GF bread (a rare, rare treat) and had a ham, brie, fig jam and hard boiled egg yolk grilled sammy just like they do in France and long hoped for trip! I love biting in anything an tastin all the wonderful flavors of each cook's contribution and a chance to sit and remember precious shared moments and foods. And by the by I adore this photo of you and your son! My very favorite holiday food is the lasagna....and the eggplant. Ok, that's 2! Oops! Forgot to include my email. Oops for me too! I forgot to leave my email. This looks waaaay too delicious I'm not even joking!